I promised that MommyMaestra readers would always receive an opportunity to download any printables that I create for free. So in honor of Día de los Muertos, I have quite a few printables coming this week, but each one will only be available for free to MM readers that day until midnight EST. After that, you'll have to stop by my TpT store to purchase a copy. There's been a lot of toiling going on over here. The creative juices are flowing, Mamas! 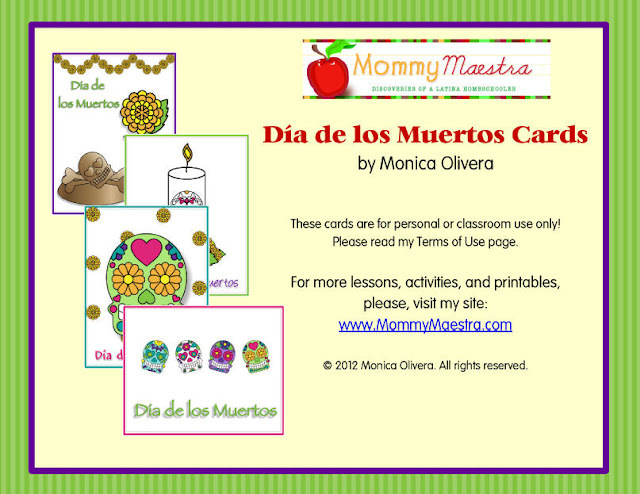 And so my first printable is one of my favorites: Día de los Muertos note cards. This set includes four different printable designs. Blank on the inside, they print up two to a page, so that you trim it straight down the middle. They are so adorable!! Perfect for writing an invitation to a Day of the Dead party, or simply to jot down a quick note to 'Buelita, these cards will liven up even cold, rainy days. To see other MommyMaestra printables, please visit my TpT store. Thanks so much! They are very cute! Omg everything on this site is amazing! I just wished I had found out about it sooner, so I could get the free resources for Dia de los muertos. They would've been a great addition to my student teaching lesson.